After years of always looking older than I really was, I finally decided to do something about it. I have been living with dark, puffy eyes for a long time. I always figured that this is the way it was going to be (unless I chose expensive surgery), but after using Vivexin for a few months, my outlook has completely changed. Almost immediately I could tell that it was working. The look of puffiness around my eyes started to decrease and within a few weeks the appearance of dark circles started to get lighter. I really appreciate this product and hope more women try it. It's a miracle in a bottle. I have been using Vivexin for 4 weeks with great results. I started using Vivexin because I was tired of having my friends say how tired I always looked. Right away I could tell that it was working. Within a few short days, the look of puffiness around my eyes started to subside and the appearance of dark circles were less obvious. I would recommend this to anyone who feels they look older than they really are. Thanks Vivexin for saving me from surgery! I have been researching how to get rid of the bags under my eyes and thought that surgery was the only option. The problem with surgery is that it is very expensive and they cannot guarantee permanent results. Luckily I came across your product and tried it. I saw immediate results. Within a few short days I noticed that the skin under my eyes was becoming firmer, smoother. What once were sagging bags, now looks smoother and firmer. You have literally saved me thousands of dollars and given me back my youth. I just wanted to let you know how well your product has worked for me. Before Vivexin, I was using three separate creams. One for wrinkles, one for puffy eyes and one for my dark circles. I was spending hundreds of dollars a month on these. When I found your product online, it seemed like a great value. What I didn't expect was how well it would work. It does a better job than my old creams at a fraction of the cost. I'm definitely going to recommend you to all my girlfriends. Vivexin is the best feeling cream I have ever tried. Unlike other "luxury" brands that go on thick and leave your skin feeling oily, Vivexin is very light and leaves my skin feeling soft and smooth. The best part is that it works so well. I have never tried a product that does such a good job at fighting the signs of aging; primarily the dark and puffy eyes. I have been using Vivexin for a month now and have great results. I have gotten many compliments on how much younger I look. I'm a 56 year old woman who thought her best days were behind her. Was I wrong. 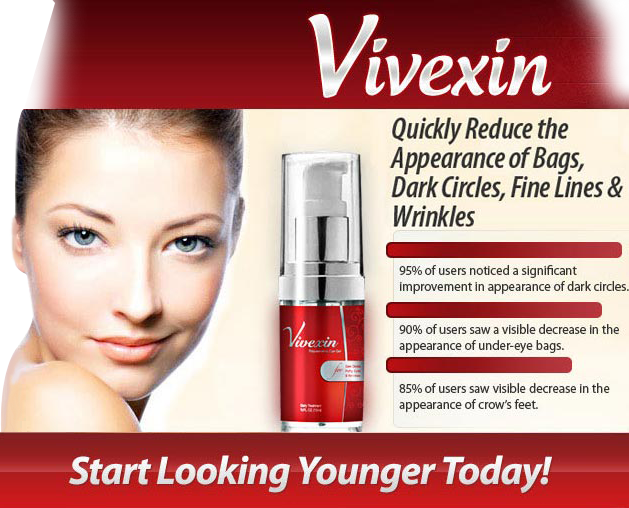 A dear friend of mine recommended Vivexin to me after learning how self-conscious I was about my aging face. I must admit, I was a bit skeptical, but tried it anyways. 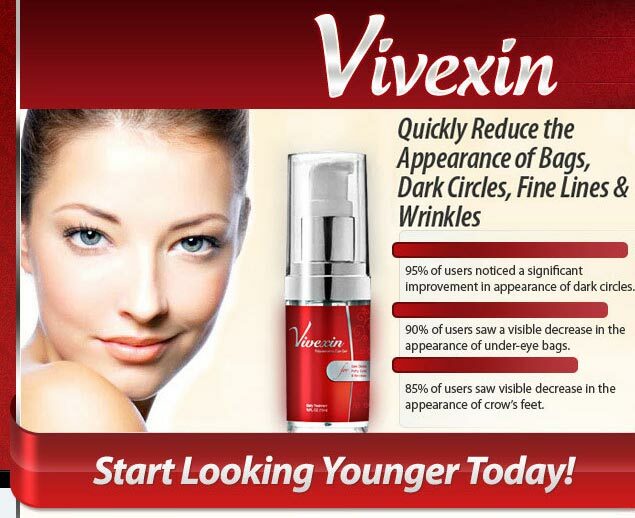 Vivexin has taken years off of my appearance. I recently ran into some old acquaintances that I hadn't seen in some time. They were amazed how much younger I looked. One even asked if I had plastic surgery. 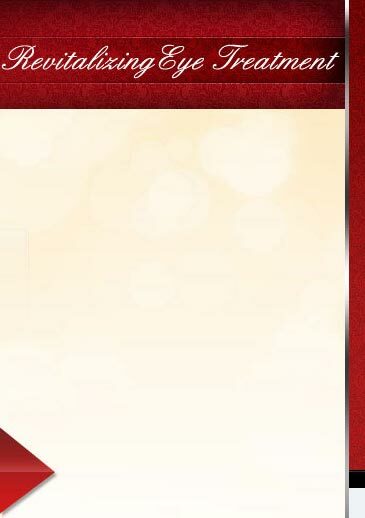 Thanks for making such great product.